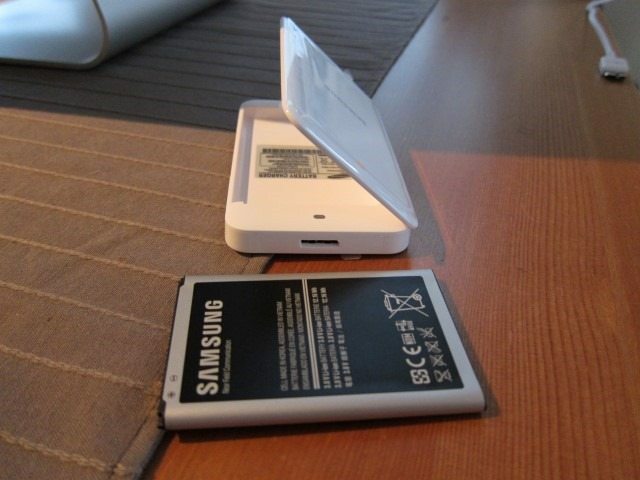 Remember the Galaxy Note II Extra Battery Kit? I loved it so much that it got a 10 out of 10. This time we’re taking a look at the Note 3’s version, same concept but slightly different. Will these change cause a drop in its final score? 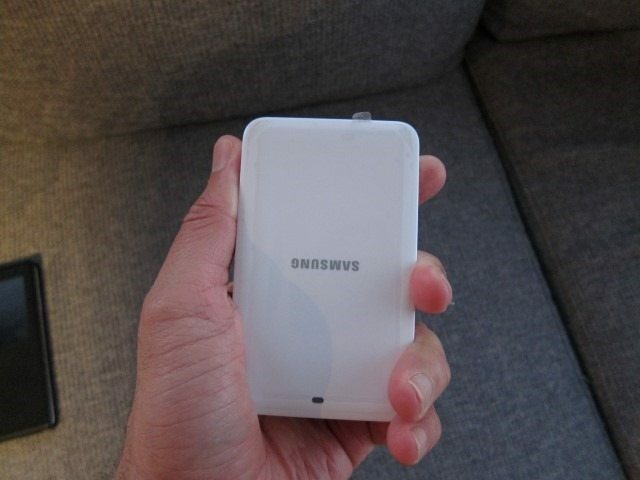 Like many Samsung accessories, this kit has different names in different regions. 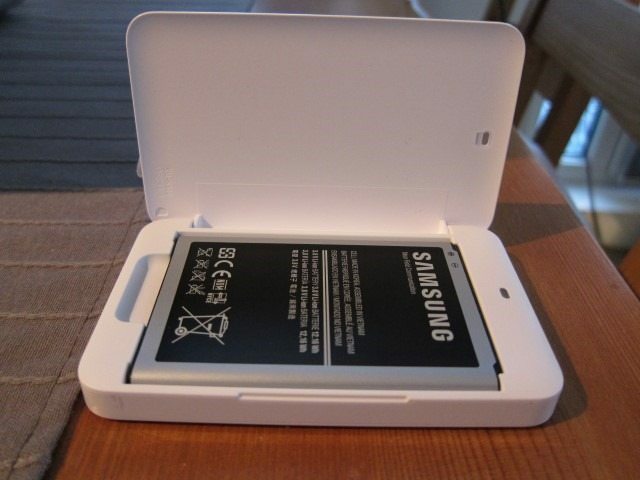 In the US for example it’s called the “Galaxy Note 3 Extra Battery Kit”, while in the UK it’s known as the “Galaxy Note 3 Spare Battery Charging System,” but the product code remains the same, EB-K800B for short, where the EB-K stands for Extra Battery Kit. 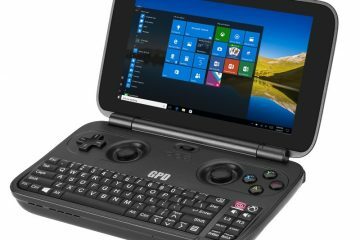 Our sample, a UK version included the charger itself, a standard Note 3 3200 mAh battery and an extremely handy clear plastic battery holder, but lacked a USB 3.0 cable or adapter. While the US version does include the adapter, it also lacks the cable. We don’t consider the omissions to be significant as it keeps the cost down. I also rarely use the USB cable and because the kit will ensure you’ll always have a full battery, an extra adapter isn’t necessary. 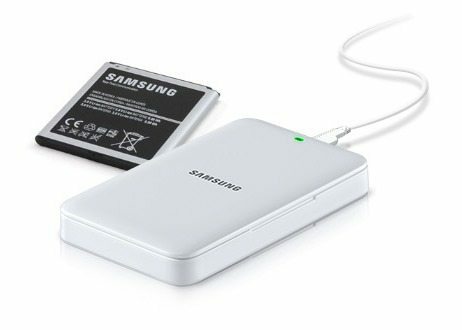 Unlike almost all Samsung accessories, the kit isn’t expensive at about $50, especially considering it even includes an extra battery. 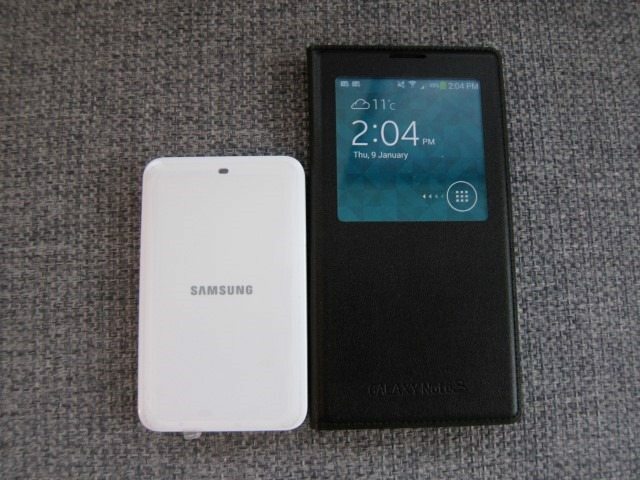 Unlike the Note II version, this version only comes in White. But that isn’t the only difference as you might have expected. 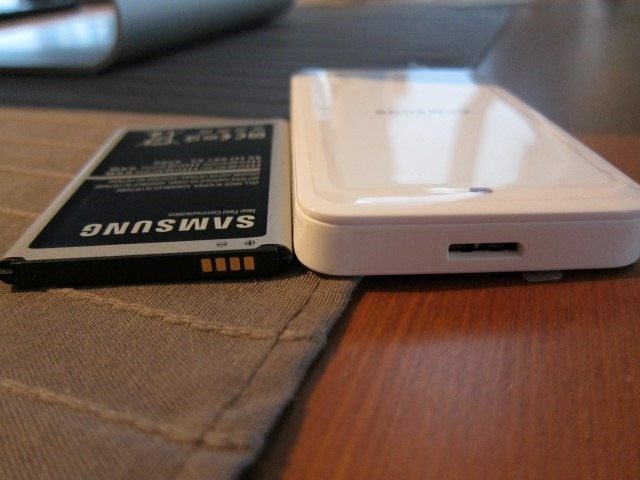 A huge difference is the fact that the second generation charger also doubled as a stand for the Note II. 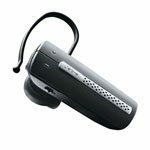 Design wise, the newer EB-K800B drops the pebble-like “inspired by nature” design language and goes for Simple Square the design the matches the Note 3’s squarer profile. 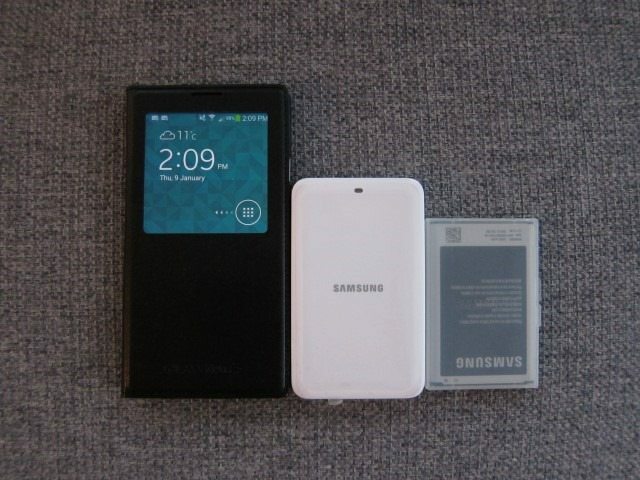 This also shows that Samsung’s accessories also follow the current design trends used on their latest phones. This new design makes the accessory thinner and with the lack of any protrusions it’s also much easier to fit in your pocket. 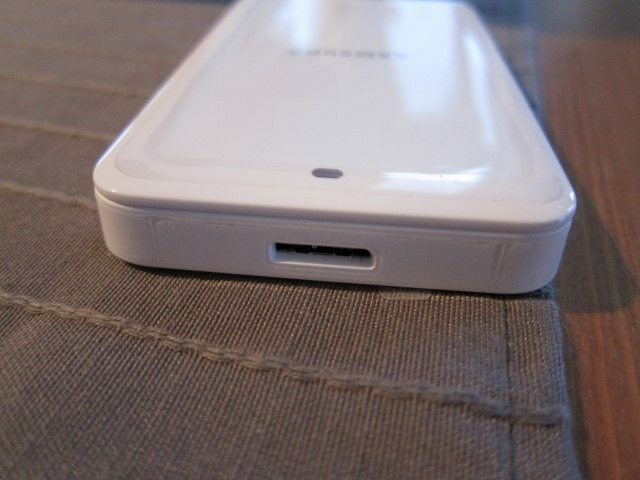 The accessory also sports the newer microUSB 3.0 connector found on the Note 3. Lastly a welcome difference is the inclusion of clear battery holder that’s even more compact and protects the extra battery from the elements. 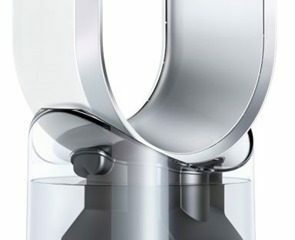 No surprises here, the accessory has an all-White glossy finish with the usual Grey Samsung logo. 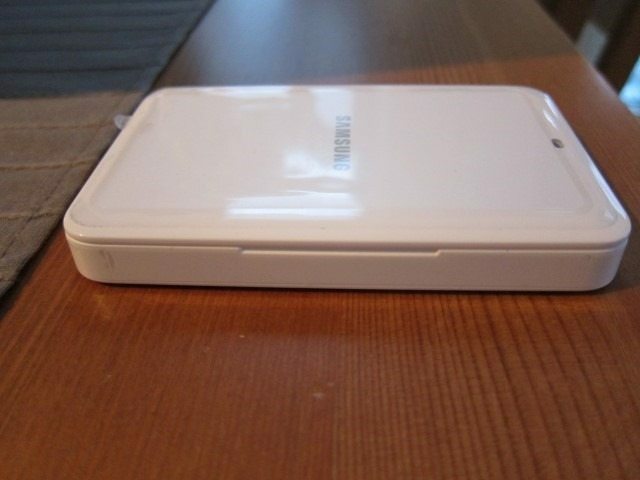 Its square profile and lines clearly shows it’s a Note 3 accessory. On the top we also find the LED light that flashes RED, Green and then Orange when you first plug it in. If the battery is empty it will turn RED and when the battery has been fully charged it turns Green. 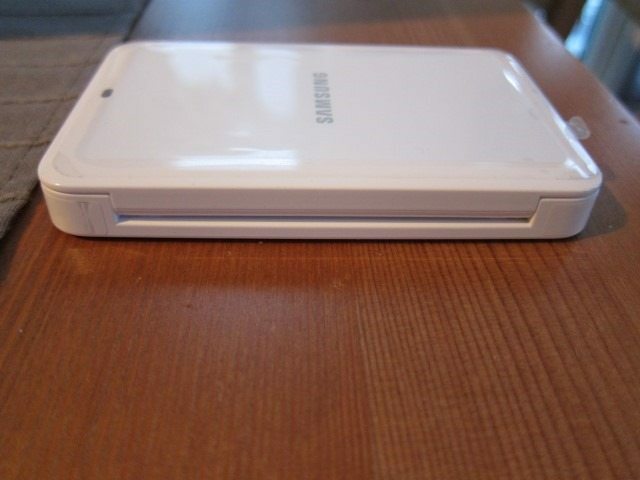 The flap is opens sideways and opens up from the left side. This lid can open a bit more than 90 degrees and will stay opened at any angle. When closed it doesn’t click or lock into place but no matter what I did I couldn’t get to accidently open which is a quite reassuring thought that your battery won’t fall out accidently. There’s a very thin seem that makes the flap easy to open, but when closed the unit is completely sealed from dust and sand. On the inside a small grooves help in getting the battery out. 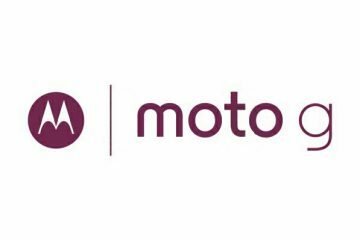 All certifications, warning and other specs have been placed inside the charger, underneath the battery instead of the usual position underneath the unit. The omission of the phone holder is a welcome one, making the unit smaller and much easier to fit in your pocket. Besides, when I would charge my battery it would probably be in some corner of my house or room, where I wouldn’t want the device to be in a stand. 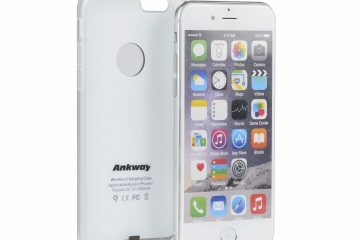 The whole point of this accessory is the ability to always have your phone without the usual down time when charging the device. Having a stand on an accessory that’s meant to be plugged in to a wall outlet meant to be forgotten is counterintuitive. 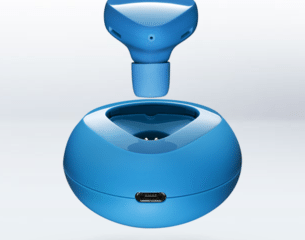 Design wise, the unit is solid, simple and perfect. The usual routine is basically having to connect your phone to the charger to a wall outlet which aren’t always located in the most convenient locations. Charging my phone at night also meant it would remain mostly fully charged and still charging, which I’m not sure is good for the battery and definitely wastes energy. If I didn’t, sometimes I would have an empty or not fully charged device in the morning. 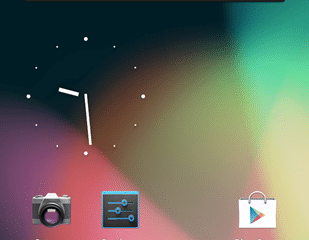 One of the rules in this universe is that your phone’s battery will probably be empty when you need it the most. The Galaxy Note 3 Extra Battery Kit basically solves all of these problems as I always have an extra, fully charged battery whenever I need it. And it’s a matter of just swapping batteries and you’re ready to go. This didn’t only mean that I don’t have to leave my device in some corner while charging, but also means that I don’t have a fully charged phone “overcharging” all night long. Which must be good for the battery and doesn’t waste energy. 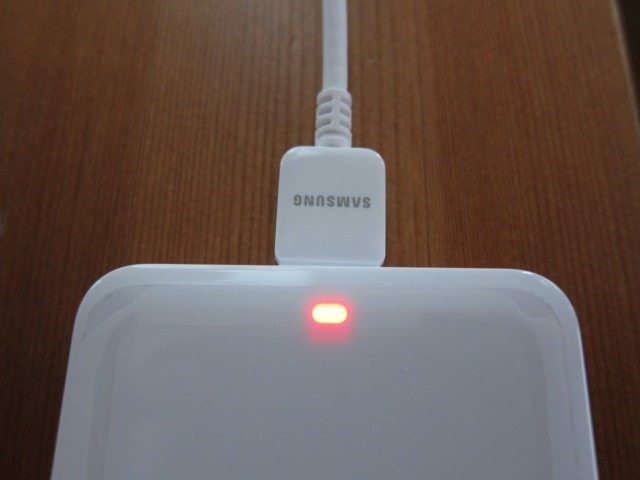 Lastly, when the battery is in the charger it doesn’t have a phone with Wi-Fi and Bluetooth to power, allowing it to charge even faster than when in the phone, given you use the Note 3’s supplied 5.3V 2A charger. If can only get one accessory other than a case for the Note 3, this should be it. Basically this accessory is a must and gets a perfect 10 out of 10.